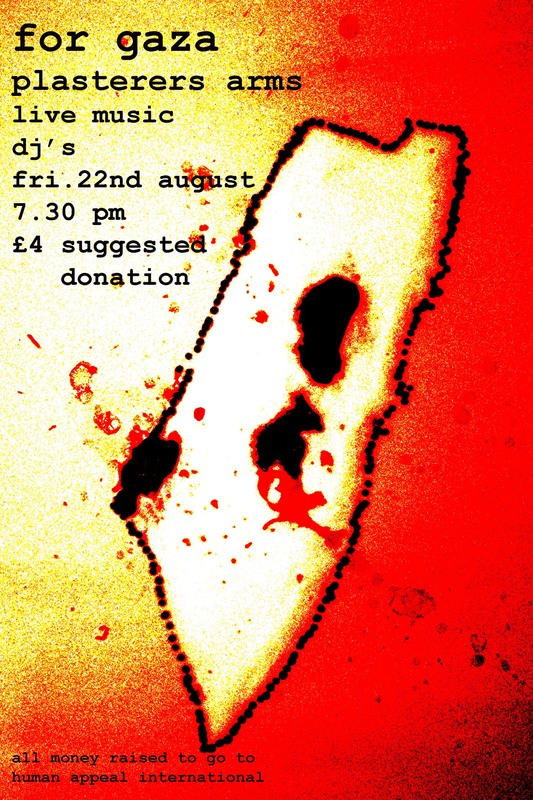 This brilliant project put together quickly by some great people in Norwich has, in a short space of time, produced a download album, a mixtape CD, and this very well attended gig at The Plasterers. See the dreadful events unfold in Gaza people were struck by a sense of shock, sadness, outrage and helplessness but to make a positive contribution of aid a few people managed to bring these fundraising projects into being, so a huge “Well done” to all of them, as well all those who contributed tracks, time, space, equipment at donations. Music was provided by the Meat Fer Manners djs and DJ Spokes, before Sam started off the live music with a short set under the banner of True Adventures. He played a very interesting storytelling song before duetting with Milly Hirst, who sounded great on electric guitar. The packed pub was a little noise but she cut through that with beautiful renditions of Kampala and Mary. We also had some short sets by ACivilian Invention, who I believe was playing live for the first time in a couple of years, and Camille Davila with Pat Falgate who included a gorgeous version of Harvest Moon.